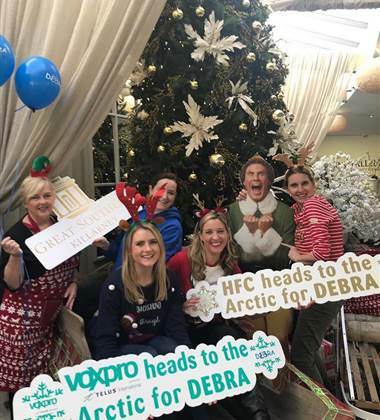 Emma Kenneally, Head of Marketing with Voxpro and Karen Fleming, SalesDirector with the Hayfield Family Collection and 2018 President of Network Ireland-Cork branch, have committed to the Arctic Challenge 2019 in an effort to raisefunds and awareness for butterfly skin charity Debra Ireland. Debra Ireland supports 300 people in Ireland living with thehugely distressing butterfly skin condition EB (epidermolysis bullosa), thatcauses the skin, both inside and out, to blister and wound at the slightesttouch. There is no known cure for EB and the only treatment is constant painfulbandaging of the skin. With the support of their respective companies, Emma and Karenwill join a 20 strong group of Irish businesswomen as they set off next March toconquer the Arctic in a survival challenge involving a six-day trek 150 kmnorth of the Arctic circle. Following two days training in outdoor survival skills, the groupwill trek into Finland's Yllas national park, where they will camp outdoorsovernight in temperatures as low as minus 27 degrees celsius. Of their mission plans, Karen Fleming stated, "Whileundertaking the training, the fundraising and ultimately this formidable trekis daunting for both of us, it is nothing in comparison to the survivalchallenges overcome daily by those living with EB and by those caring for them’. Emma Kenneally concured stating that “We were inspired to hear firsthand from Liz Collins, mother of 13 year-old Claudia who suffers from a severeform of EB, just how vital the funds raised by Debra Ireland are to all the families who are coping with EB andbattling bandages on a daily basis”. Emma, Karen & their fellow businesswomen taking part in theArctic Challenge each have a remit to raise a minimum of €5,500. To this end,Emma and Karen have a number of fundraising initiatives on the horizon, thefirst of which shall take place on the 16th of December at GreatSouthern Killarney, sponsored by the Hayfield Family Collection which alsoincorporates Hayfield Manor in Cork and Killarney Royal hotels. This ‘FestiveFamily Flick’ event will be held in the tiered theatre at Great SouthernKillarney and will feature a screening of the Christmas movie favourite; Elf. Thiswill be a ticketed event and ticket holders will invited to indulge in pre-movietreats such as homemade hot chocolate, candyfloss and popcorn before movie timecommences–and all for a great cause! Tickets available on Eventbrite or bycontacting the Events Team at the hotel directly on 064 6638000.